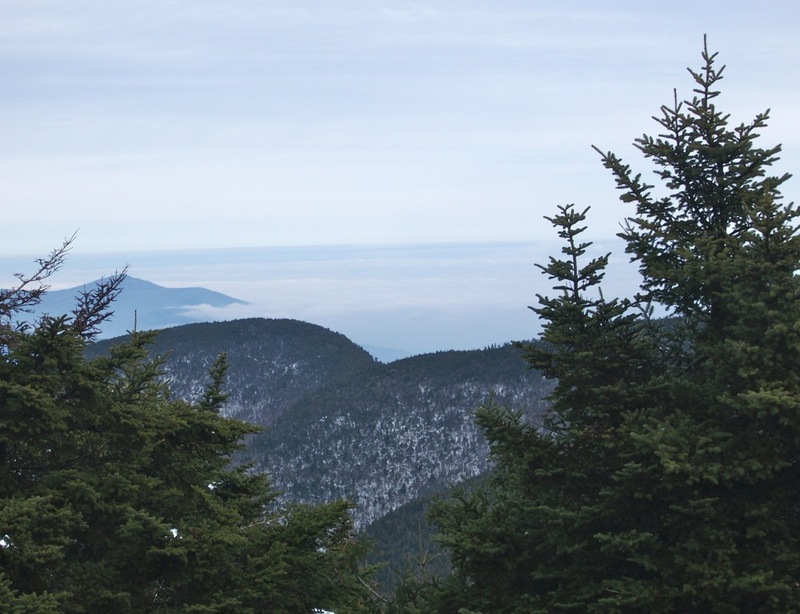 In late January, I headed for Slide Mountain, at 4,180 feet the highest peak in the Catskills. I had just finished a grueling stretch at work and was eager to get out of the city. I went alone. As I skinned up from the parking lot, I had to rely on the sporadic trail markers and hope that the predicted fog and “wintery mix” would hold off. The trail had some snow, and lots of exposed rocks as well. As I climbed I considered whether backcountry skiing is merely a way to access unskied lines or something different altogether. I’m sure it means different things to different skiers, but for me it’s about being in the mountains and escaping. When I was younger, I’d spend my days at Killington skiing the bumps under the chairlift: Cascade, Needle’s Eye and Outer Limits were my go-to spots. I was good, and I knew it. The pleasure was in the show. I dug hearing comments from the lift above me or sensing admiring eyes. But the winter scene was much more serene with no one else on the trail. 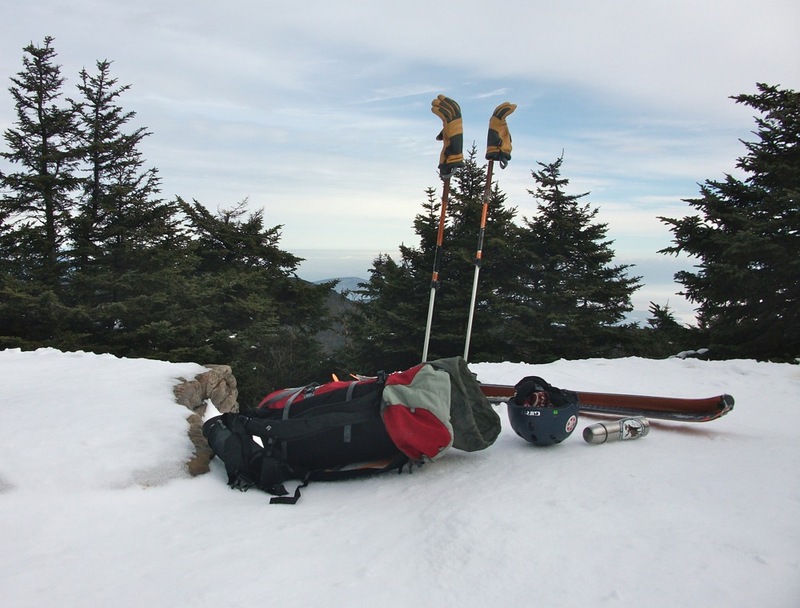 I reached the summit ridgeline at 3,800 feet and began the traverse towards the top. Views opened, and I could see the empty Catskill Mountains. Deciduous trees gave way to a boreal forest comprising mostly thick balsam fir. The air grew chilly. The sun was still out—but the tightly packed, frozen trees above me blocked both sky and sun. All was mountain and forest on every hand. Civilization seemed to have done little more than to have scratched this rough, shaggy surface of the earth here and there. In any such view, the wild, the aboriginal, the geographical greatly predominate. The works of man dwindle, and the original features of the huge globe come out. Every single object or point is dwarfed; the valley of the Hudson is only a wrinkle in the earth’s surface. You discover with a feeling of surprise that the great thing is the earth itself, which stretches away on every hand so far beyond your ken. I could see the predicted storm slowly approaching. My descent was down the narrow hiking trail. No room to turn, no place to bail out, just a semi-controlled snow plow burning my thighs. Frozen tree branches crashed against my helmet and goggles. And lower down, the rocks reemerged, chaffing the metal edges of my skis. It smelled like my father’s welding studio. I stopped to consider. It would take me much longer to hike down, but navigating the slick hidden rocks seemed risky. I chose to hike. Strapping my skis to my pack, I laughed that many would deem this the worst possible skiing. But, for me, it was ideal — just me and my skis and the mountain. At the advancing age of 48, I now know where true pleasure lies — for me. It’s in quiet, physically demanding adventures in the backcountry where the descent is just one facet. That’s where I want to be now, where the mountains loom large and the self loses prominence. Returning home and showing others impressive pictures of lines I skied would surely stroke my ego, but would also feed a consciousness that is exactly what I’m looking to escape. Skied Slide Mt. last year at the end of March was able to ski down most of the trail linking turns, snow was decent. The skis probably made the difference, I had those short wide Marquettes. Good read. Always an interesting experience when such a simple thing as having an adventure begins to take on transformative qualities. It is great that such a simple thing… taking a hike, can heal some of life’s battle scars and get us reconnected to what we feel is important. Cheers! Lovely, Zeb. That’s what skiing is really all about. Though I’m sure a little more snow would have been welcome. Excellent report, Zeb. I wish you many more poetic adventures in the woods. A quick fact about Slide though, the summit elevation is always in dispute, and it’s been many years since it’s been resurveyed. On my GPS when I’ve hiked it previously, I have had reports of up to 4220′ feet displayed. For some reason, I always thought that was really cool, if true. Great story. Who says you can’t have both. I still love moguls and I still love the back country even as I turn 50 next month. Zeb..although I was not as adventurous as you I did however love skiing the higher elevations and taking in the beauty of nature..great commentary.. When I was about 10 years old I read “My Side of the Mountain,” about a boy from NYC who goes to live alone in the Catskills for a year. It really gave me a love for the mountains of New York State, and this gave me a bit of the same feel. (The movie was awful, I recommend the book). My only recommendation would be bringing 2 cell phones, a backup that you could turn on if your first one goes dead or gets lost in the snow. Or an avalanche beacon. I better go now, I am starting to sound like my Mother. I have cross country gear and enjoy doing that on rare occasions, but I’m primarily a weekend-liftserved-ski-warrior. I have always told myself that when I retire I’ll have the time and access to go offpiste in a bigger way maybe with AT gear—but someday is taking a long time to get here! Beautiful, thoughtful, joyful piece. It made me want to return to downhill skiing. I second Gore Kid’s recommendation to take 2 cell phones with you on these lone ventures. You may be “advancing”in age, but you make this approaching 80 year-old green with envy. Thank you, Zeb. Great piece. Zeb was this an out and back trip? From which trail head? 70s Gore Kid, i know that book well. Thanks for sharing – slide mountain now on the xcd hit list! Is it climbable with waxless fish scales or are skins/snowshoes required? Thanks for all the kind words. You might want to check out an earlier post by Ron Konowitz about Slide, which gave me the idea to ski it. It includes a nice video http://nyskiblog.com/ski-mountaineering-on-slide-mountain-ny/. Steve, your certainly right about all the gear! While I search for places where the “works of man dwindle” I also find myself reading about all the latest gear. There’s got to be a way to reconcile the two, no? Peter, it was an out-and-back trip. I took the trail head on Route 47 out of Big Indian. Gorgonzola, I don’t really know about getting up there without skins, but it’s never super steep. JJ, you can certainly get AT gear and use it at the resort. I’m full time on AT gear. In fact, it’s so light and comfortable, I can’t really imagine going back to conventional alpine equipment. A lovely vivid tale – the sense impressions are wonderfully strong, and you give us a sense both of your personal history (and current experience) as well as of the history and current state of the spot. Thanks. k.
As Burroughs says “the great thing is the earth itself.” We must take care of and enjoy our beautiful planet. It was a great read. Thanks for the article. Zeb, What motivated you to call this blog “Slide Mountain, NY: Finding Myself Alone”, not that the title does not go with the content, I am just wondering. Great job Zeb. @ski Pro: the title was the great idea of my excellent editor.